According to the manual, PDOS is a powerful multi-user, multi-tasking operating system developed by Eyring Research Institute, Inc., for the Texas Instruments compatible processor family. That means TMS9900 and TMS9995. 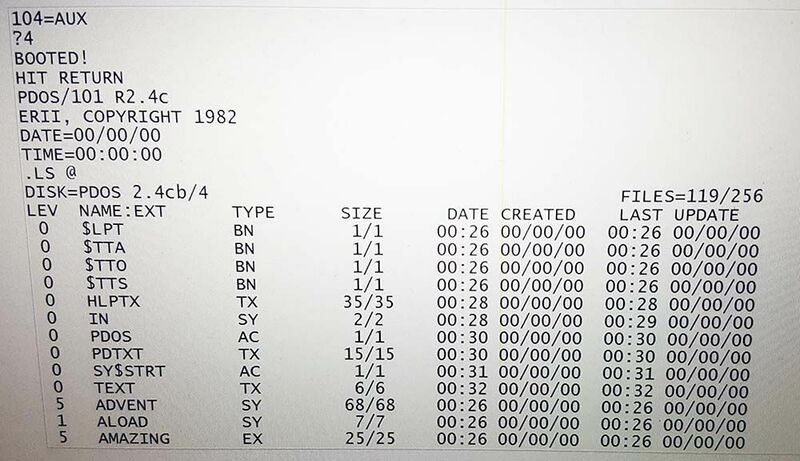 Originally developed for the Texas Instruments TM/990 modules (Excellently documented by Stuart Conner here) by Paul Roper (PDOS = Paul's DOS), PDOS also runs on the TEP FTI990, a TMS9900 system built on Eurocards. I have one of these systems, and with it came some floppy disks with PDOS 2.4C, as well as the PDOS Programmer's Reference Manual. Since I strongly believe in sharing the wealth, I am making my findings public here, including downloads of the OS and documentation. The software is (C) Copyright 1982 by Eyring Research Institute, Inc. If you have a TMS9900 based system, and you want to get PDOS running on it, contact me about building a ROM image for you. It's easier when you've got a running system to work with! Communication with PDOS is through TMS9902 serial ports (multi user). After turning on the TMS9900 system and pressing the restart button, nothing seems to happen. The boot rom is waiting for a <CR> to be sent to the primary serial port. It uses this character to autobaud the serial port. The serial port should be set to 7 data bits, Even parity, and 2 stop bits. Baud rates of 110, 300, 1200, 2400, 4800, 9600 and 19200 baud are supported. The JED and JEDY full-screen editors expect the terminal to recognize Televideo 9xx escape sequences. Any other answer than a capital Y makes the devices unavailable to PDOS. The "." is the PDOS command prompt. It can be changed as part of the BFIX (boot fix) procedure. File names on PDOS take a little getting used to. File names are up to 8 characters, with an optional 1 to 3 character extension. The filename and extension are separated by a colon (BOOT:SR is a valid filename). If a file is not on the current system disk, it needs to be followed by a slash and the disk number (BOOT:SR/1). A disk can be divided into 256 numbered directories, indicated by a semicolon (BOOT:SR;5/1).